Within the realm of tech startups, Southeast Asia has certainly elicited no shortage of investor interest and cash-strapped entrepreneurs chasing the unicorn dream—and rightly so. The region is home to the world’s third largest base of Internet users, with a fast-growing online economy now set to exceed US$ 200 billion by 2025, according to an updated report co-authored by Google and Singapore’s sovereign wealth fund Temasek. With 3.8 million new users coming online each month, market opportunities are increasingly ripe for the taking across these frontier markets that are just now coming to terms with rising affluence, consumer sophistication, and widespread digital penetration. 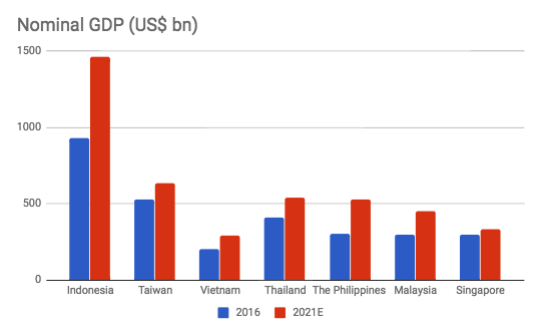 As a region, Southeast Asia has become a ubiquitous classification that is generally understood to encompass the 10 nations under ASEAN, with a primary focus on the six largest markets of Indonesia, Philippines, Singapore, Malaysia, Thailand, and Vietnam. But what if you, perhaps quite sensibly, lumped Taiwan into the mix? 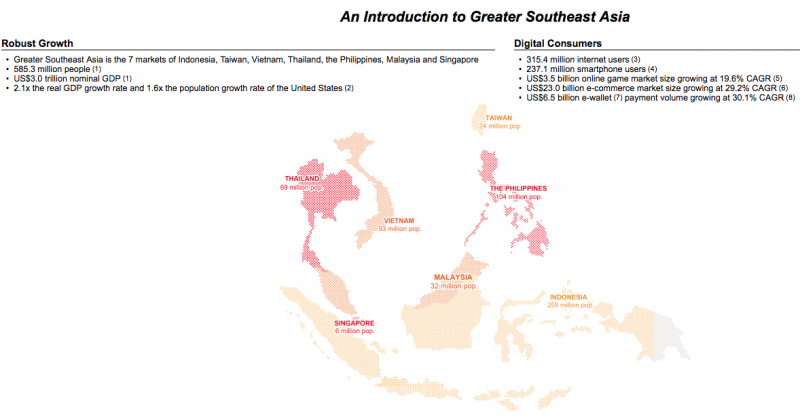 So enters Greater Southeast Asia. It’s a rather colorful illustration that has long been applied to the formative grouping of 10 ASEAN nations. 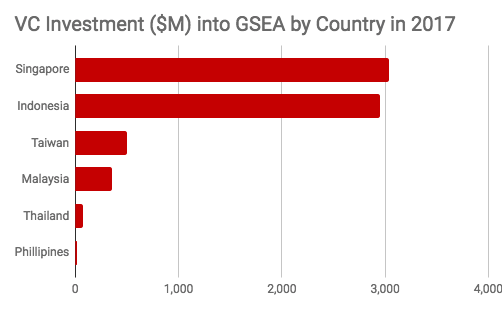 And given that 90 percent of Sea’s revenues is largely derived from its Garena gaming business, there’s a stark possibility that Taiwan was merely roped in for its regional dominance in online gaming. However, a closer side-by-side comparison reveals a market that can not only hold its own when it comes to economic clout and technical ingenuity, but also serve as a guiding beacon for its more emerging brethren in the region that have only recently begun fully embracing the digital age. 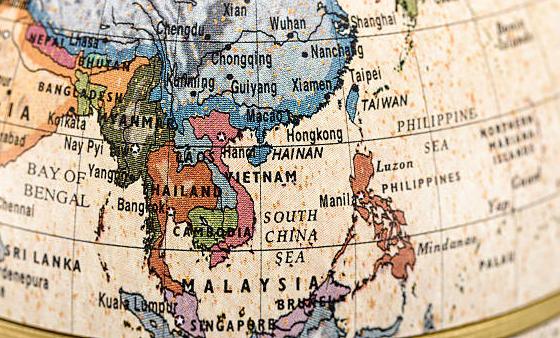 By and large, Southeast Asia’s startup landscape is still in its infancy, particularly when stacked up against mature markets such as US and Europe or even China where unicorns are comparatively abundant. To date, only 10 startups have crossed the coveted billion-dollar valuation threshold, with an average age of 6.5 years running across the board. Unbeknownst to most, there is actually one unicorn to have come out of Taiwan’s stable—online English learning service TutorABC, which was established in 2004. That being said, Taiwan’s internet sector extends much further, with the earliest instance of e-commerce dating back to the late 90s when local online shopping champion PChome was founded. That means Taiwanese citizens have been purchasing on the web for the better part of two decades. It should therefore come as no surprise that the percentage of residents who shop online in Taiwan is surpassed only by the US and UK. Coupled with smartphone penetration reaching upwards of 75.8%—the 2nd highest in the world—this little island has actually given way to the largest e-commerce market in Greater Southeast Asia, for now at least. Aside from a few other challengers such as Momo, Taobao, and Yahoo!, PChome’s dominance over the domestic market had been left more or less uncontested since its establishment—that is until Singapore-based Shopee (Sea’s e-commerce arm) entered Taiwan in 2015. 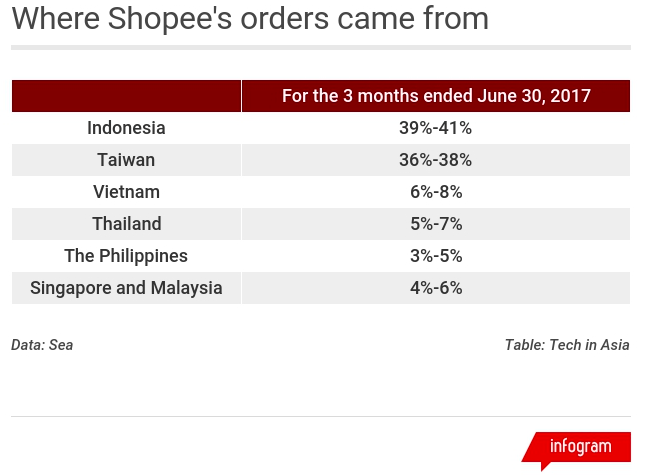 By adopting a mobile-first strategy, Shopee truly hit home with the nation’s digitally savvy and cyber-hungry population. Monthly orders grew rapidly to roughly 5.8 million per month, effectively usurping PChome as the market leader and contributing more than a third of the group’s total orders by Q2 2017. Naturally, more and more foreign players have caught wind of the latent opportunities in Taiwan’s internet and mobile economy that are evidently up for grabs, despite its maturity. Southeast Asian startups such as Carousell, Shopback, and Honestbee have increasingly prioritized Taiwan along their regional conquests, a trend that’s likely to continue moving forward. With only a population of 23.5 million people, Taiwan actually boasts the second largest economy in terms of nominal GDP when stacked against ASEAN countries. The country also displays—albeit unofficially—a human development index of .882, superceded only by Singapore in the GSEA region, while also scoring highly on most international rankings including global competitiveness, ease of doing business, and most notably innovation; According to Bloomberg’s Global Innovation Survey in 2014, Taiwan was cited to have the highest number of patents per population, and per R&D expenditure in the world. While unable to keep pace with the lucrative growth rates of an Indonesia or Philippines, Taiwan offers several fundamental factors conducive for bootstrapping and developing startups. Not only are the living costs a third of what you might find in Singapore, but the availability of technical talent far exceeds the rest of GSEA–perhaps best validated by Google’s US$ 1.1 billion acquihire of HTC’s smartphone assets, reportedly consisting of 2,000 engineering and design talent. Currently, Taiwan boasts roughly 8,000 software engineering graduates per year, with average annual salaries hovering around US$ 20,400, compared to approximately 4,400 graduates and US$ 35,000 respectively in Singapore. This is on top of the roughly 25,000 electrical engineers the country’s academic system churns out every year, truly speaking to the country’s longstanding heritage of semiconductor and hardware manufacturing. This grants aspiring innovators a unique opportunity to capitalize on the trending intersection of hardware and software, especially when it comes to IoT, smart city, and Industry 4.0. From a VC funding perspective, although visibly minimized by Singapore and Indonesia, Taiwan still manages to come in a resilient third. And if we back out the billions of dollars raised by the region’s handful of unicorns, namely Grab of Singapore and Go-Jek of Indonesia, you realize Taiwan is just as good a place for an early-stage startup to raise money as those 2 countries. Certainly recognizing its limitations as an end-all, be-all type market, Taiwan’s government has been pushing for a more future-ready environment that fosters and embraces innovation, rather than stifles it. Whether it’s establishing a regulatory sandbox, launching a dedicated AI research lab, unveiling a US$ 333 million national VC fund, or even just loosening its borders for foreign talent, it’s clear that Taiwan is keen on cultivating an ecosystem that can attract and enable startups from all over the region to keep up with the evolutionary pace of technology. 2017 marked the 50th anniversary of ASEAN, a collective club of chaotic and sprawling settlements, historically only seen in the underbelly of neighboring behemoths China and India, until recent times that is. Open up the front page of Tech in Asia or e27 and you’re bound to come across the latest high-flying valuations of Southeast Asian tech startups disrupting traditional industries. For Taiwan, though, the last 50 years have largely operated under the impetus of “Greater China.” While this term is not an official political classification, it infers an dependent type of relationship that has long confined Taiwan and its economic future to forces outside of its own control. Taiwan’s “New Southbound Policy,” short of formally joining the intergovernmental organization, strives to align the island nation with ASEAN countries. Specifically, it fittingly contextualizes the country’s technical brawn, mature digital economy, and longstanding penchant towards innovation as the beating heart of a region currently bursting with opportunities. 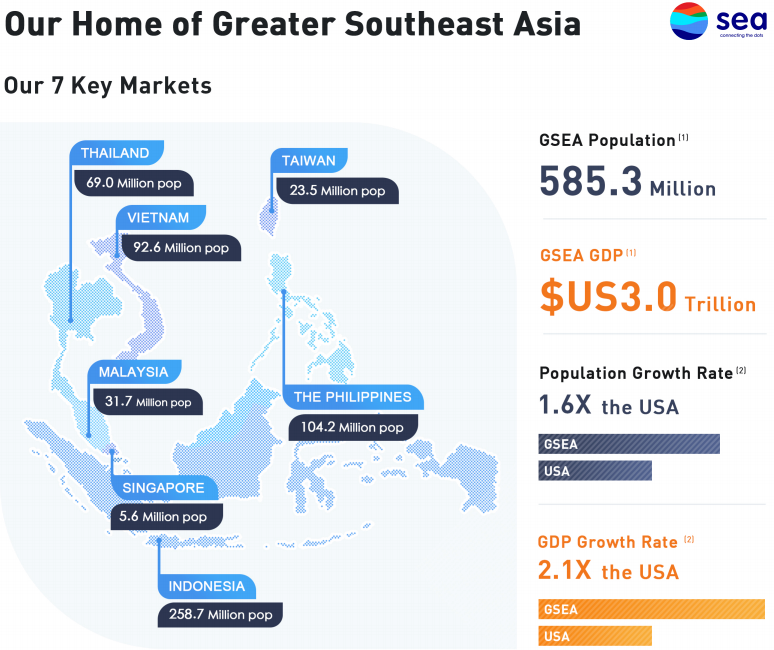 If you’re a startup in the region looking to capture both scale and monetization, both growth and margin, and to build both local operations and a regional R&D hub, then expanding your scope to include both SEA + Taiwan hence, Greater Southeast Asia, is increasingly looking like an avenue that you can’t afford to miss. For more information on how ambitious entrepreneurs across Greater Southeast Asia can leverage AppWorks Accelerator to capitalize on the region’s digital awakening, visit our website.